It is interesting to note that in many of the tongue maps that appear in modern texts, the authors do not cite any source for the map. The tongue map has become an enduring scientific myth. 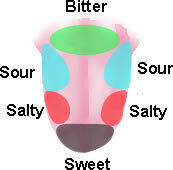 The apparent simplicity of the tongue map has made it a popular laboratory demonstration in children’s biology classes. The popularity of this laboratory demonstration is particulary amazing considering that it must fail to produce the expected results quite regularly.